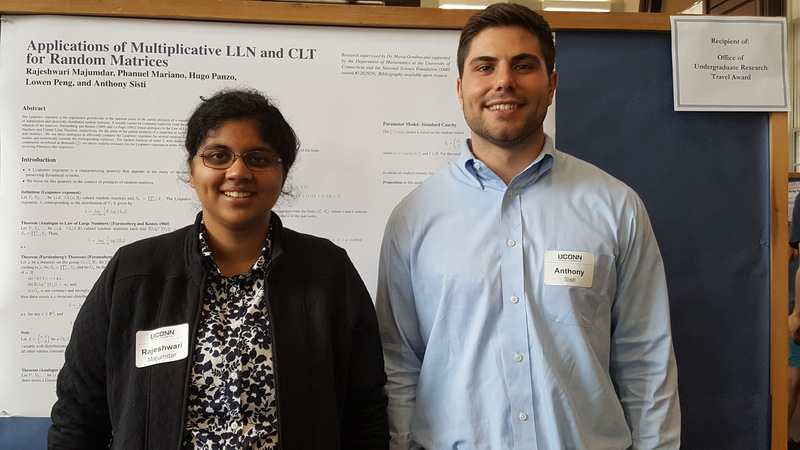 On April 19, 2018, UConn’s graduate student chapter of the American Mathematical Society (AMS) organized the math department’s first annual integration bee, in which undergraduates came together to test their skill at (indefinite) integration. After welcoming remarks by department head Ambar Sengupta and the AMS Graduate Student Chapter officers, the students got to work. In the first round each student was given 5 minutes to compute 3 integrals. In later rounds students came up to the blackboard in groups of four to compute an integral in four minutes. A wrong answer or no answer was a strike against a student and, unlike in baseball, after 2 strikes the student was out. After three hours the four remaining contenders were Nick Juricic, Grace Lauber, Zhongwei Wang, and Zerun Zhao. Grace and Zerun competed for third place, with Grace clutching that position with only seconds to spare. In the last round Nick and Zhongwei competed to compute the integral of cot(x)sec^2(x), which Nick figured out to take first place. The winners received gift certificates from several area businesses: Bonchon Chicken, Gansett Wraps, Kathmandu Kitchen, Lizzie’s Curbside, Moe’s Southwest Grill, Starbucks, and Subway. All participants received a free meal compliments of the AMS and the brain nourishment that comes from solving math problems. The AMS graduate student chapter thanks all the participants and volunteers for their help making this event a success and it looks forward to organizing the Integration Bee again next year. 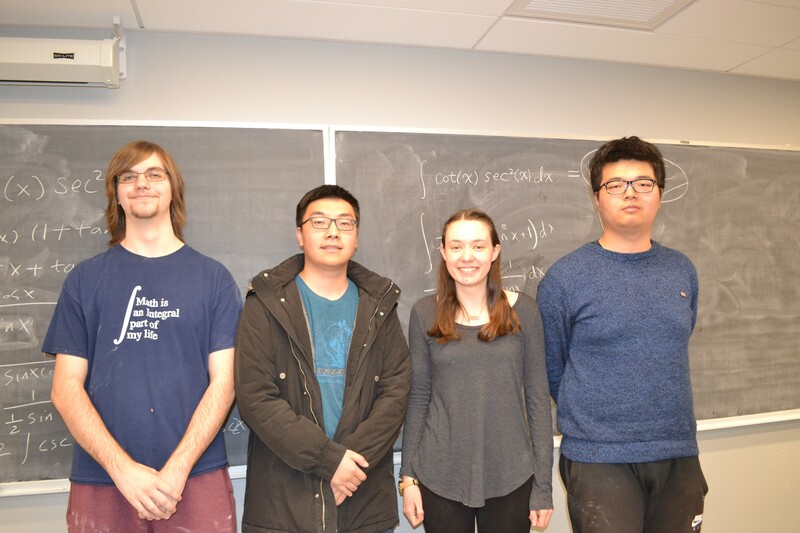 Pictured above, from left to right, Nick Juricic (1st place), Zhongwei Wang (2nd place), Grace Lauber (3rd place), and Zerun Zhao (4th place). Please mark your calendars to come celebrate and support our students’ achievements! The Department of Mathematics’ Annual Awards Day Ceremony will take place on Wednesday, April 25th. There will be a small reception at 3:00 pm in MONT 201, followed by the Awards Ceremony at 3:30 pm in MONT 104 and invited lecture at 4:00 pm by David Constantine (Wesleyan) on “Entropy, Symmetry, and Rigidity”. AMS Student Chapter Presents: First Annual UConn Integration Bee! On April 19th the math department will host its first integration bee, which we hope will become an annual tradition. An integration bee is like a spelling bee, but students take turns computing integrals instead of spelling words. There will be prizes for the top students and free refreshments for everyone. The Integration Bee will take place on April 19th at 5 PM in Monteith 313. All undergraduates who are familiar with the material on integration methods from Calculus II are welcome to participate. Walk-ins are welcome, but it is preferred that students who plan to attend send an email by April 18th to Zoe Cramer. The event is organized by UConn’s AMS Graduate Student Chapter. 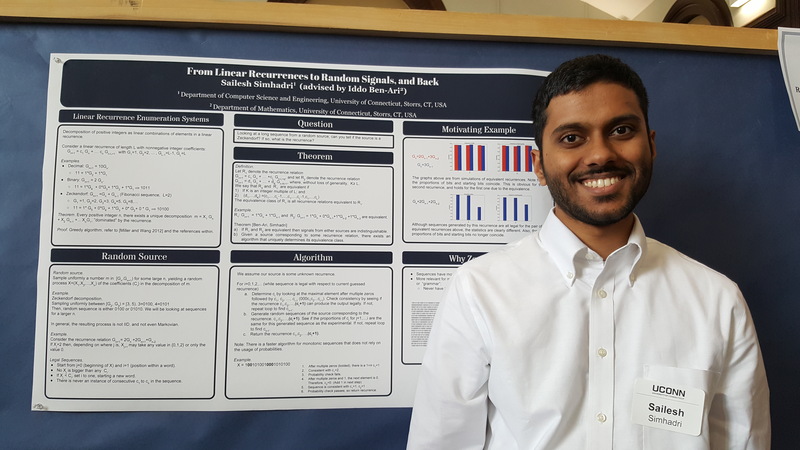 Phanuel Mariano, a graduate student in mathematics, received the 2018 Outstanding Graduate Teaching Award from the Center for Excellence in Teaching and Learning (CETL). This is a university-wide award, including the regional campuses, that honors Teaching Assistants who have gone well beyond the call of duty to affect the student learning and experience for undergraduate students at UConn. The Outstanding Graduate Teaching Awards were established in 1999 to recognize teaching assistants who demonstrate excellence in the classroom or laboratory. Nominees for this award must demonstrate effective instructional skills, possess excellent interpersonal skills, provide practical feedback, and contribute to the development of the instructional program. 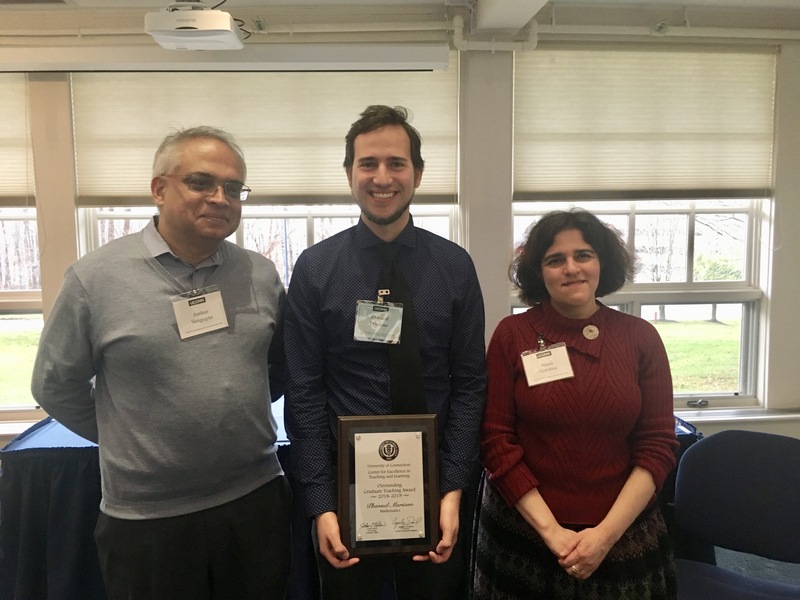 Above, Phanuel Mariano, center, is pictured at the CETL awards reception, with math department head Ambar Sengupta, left, and Phanuel’s advisor and math department associate head, Maria Gordina, right.